I have this very fond memory from when I was a kid. Staying at my Nana’s house and being ‘let loose’ in the kitchen. She gave me a plate full of flour, sugar, milk, sultanas, an egg and spices. With these ingredients I could do what ever I wanted and then she would cook it. Blissfully happy, I have no idea how it tasted, but I remember vividly the pride I had that I could choose what ever I wanted to do with those ingredients. It never happened again, and if I was cooking at home I always had to follow a recipe. Mum said I had to learn the basics first before I tinkered. Actually she was right, darn right. Because I know a lot of the basics now, tinkering with food makes more sense then when I cooked that flour, milk, sultana concoction. Playing with food and its different flavours can be so much fun. The last few months I have been playing with sourdoughs, love it, love it, love it. The last few weeks I’ve been playing with plaiting sourdoughs, plaiting, plaiting, plaiting. Then just I was about to embark on a certain ‘starfish’ that needed an intricate amount of plaiting, my brain said oh oh oh…but what if we did this instead?…Cross this with that, then that with this…Oh ok…Lets give that a whirl. …and that dear people is why it’s fun to play with your food. As you never know what you’re going to get. If you would like to weave your sourdough. Make up your usual dough and when its time to do the shaping make your self a large square. Cut equal strips to go down and across. (For this one I did 8×8 strips) Making sure the strips are well floured, otherwise they will just blob together when having the final prove. Then tuck and loop, tuck and loop. For the edges, trim and then gently tuck under to tidy the sides up. This bread makes for a good addition to soup, as it easily pulls apart. * This post submitted to yeast spotting. This entry was posted in Baking Bread, Food Glorious Food and tagged bread, cooking, food, frugal meals, recipes, simple food, sourdough, weaving bread by cityhippyfarmgirl. Bookmark the permalink. i really love this…so much. i am going to have to try this with the littles. First, what a wonderful grandmother! Second, what a delightful looking loaf of bread. I like taking a swatch of bread, cutting ribbons of it down the sides and then folding them over each other, with some kind of a filling in the middle. I used to do lot of a bread baking, butI don’t do so much lately. Very nice!! It’s so much fun playing with food. 🙂 Next your monkeys will be wanting to weave it for you! Fantastic! So much fun and it looks so beautiful as well, great job, Brydie! Who’d have thought bread could be so pretty! Thats a shame Rachel… I’m a total convert to the sourdough. My starter can be a little moody sometimes, but so far (fingers crossed) nothing a little flour/water love does’nt sort out. Wow- You have been plaiting up a storm! Looks great and probably tastes even better! Heidiannie I’ve half done it, (the starfish that is) but ran out of room! I’m not sure that I can do it smaller, and my oven and trays just don’t seem to be big enough, or bench space… It’s still on my mind though. I’m all for playing with your food – especially when it ends up with results like this!! What’s this starfish then? OK, i’ll go and google…. returns …. 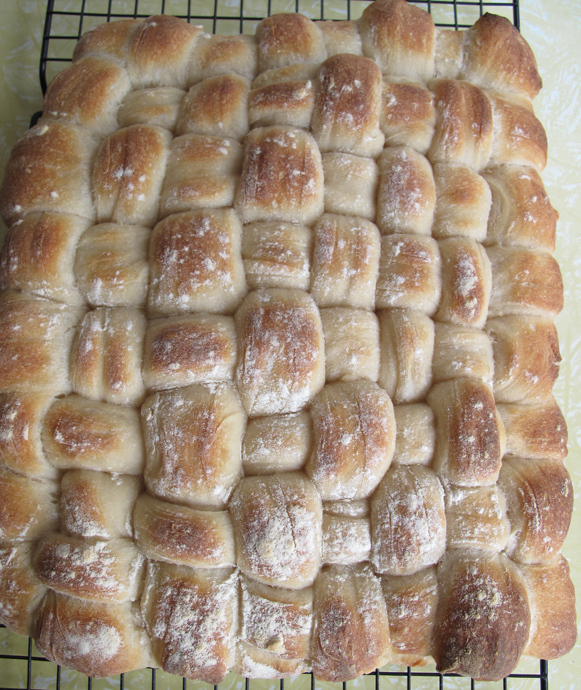 you mean like this http://www.blackwidowbakery.com/demo/12braid/index.html that looks mindblowingly difficult!!! I can just about do a three braid…. What a great grandmother and Wow…. with the weaving – looks awesome Brydie. 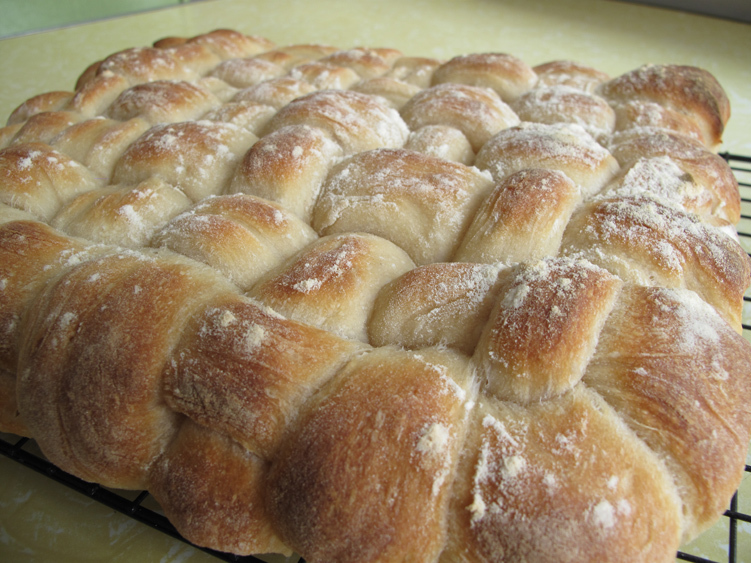 Love the woven bread…great fun and a lovely loaf.